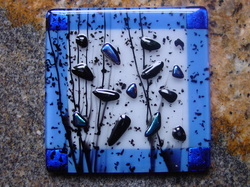 Glass Tiles - Dichroic Tiles - Iridized Glass Tiles - mix & match with ceramic and stone for true custom tile work in your home. 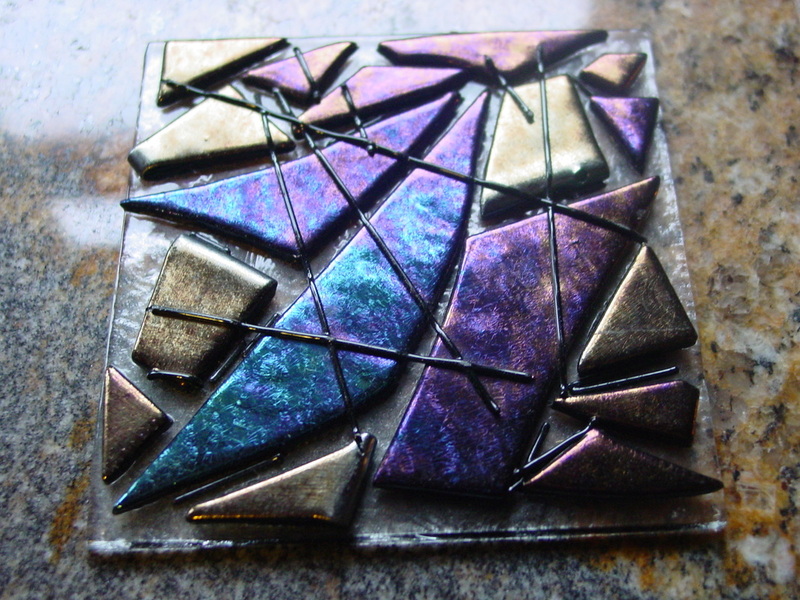 All dichroic tiles here, these can be made many sizes, shapes and colors. Stringer detail shown on the center tiles. 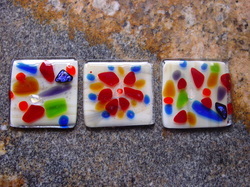 Random or planned designs, color mixes and dichroic accents on these tiles. These tiles had great colors, and this photo was actually taken before the final cold work and fire polish for clean edges. Imagine mixing this in here and there to your beige, gray or white tiles... POP of color anywhere you want! 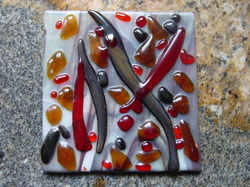 This tile can be made many sizes and with all of your favorite colors! 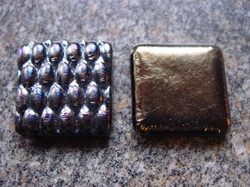 There are new coatings in the glass market that allow bronzes, pewters, golds and silvers to shimmer in tilework! The textured tile is a personal favorite of mine. 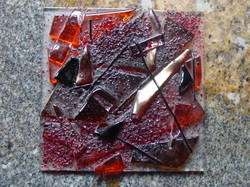 Contemporary, glass artwork in your backsplash. Cleaning just requires a soft toothbrush and a rinse with water. 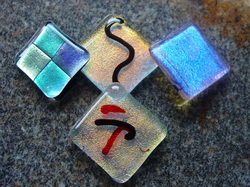 Slight relief, dichroic chips on streamer frit glass. This is a set of matching triangular tiles done in streaky brown base glass with clear mosaic dichroic fused on top and an extra layer of clear to show depth into the tiles. 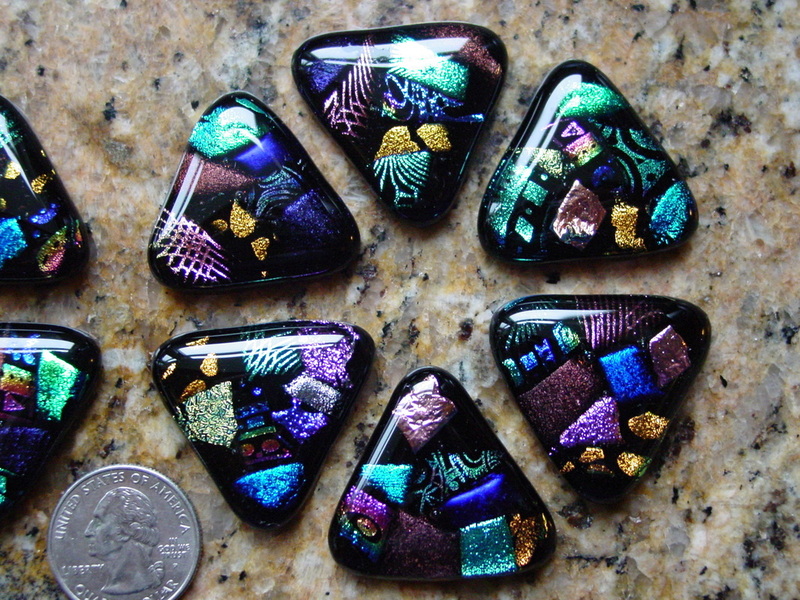 The set shown below is done with some patterned dichroic and some plain dichroic on black base tiles and capped with clear glass.